Trust relationships are vital to the way we do business today. In fact, the level of trust in business relationships, whether internal with employees or colleagues or external with clients and partners, is the greatest determinant of success. The challenge is having a conceptual framework and analytical way of evaluating and understanding trust. Without the proper framework for evaluating trust, there’s no actionable way to improve our trustworthiness. 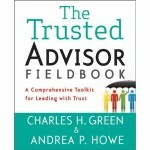 In 2000, 2006, and 2012 our founder Charles H. Green co-wrote three books: The Trusted Advisor, Trust-Based Selling, and The Trusted Advisor Fieldbook. All three books describe The Trust Equation in detail. It’s a model of trust that Charles H. Green has built and evolved over many years. The Trust Equation is now the cornerstone of our practice: a deconstructive, analytical model of trustworthiness that can be easily understood and used to help yourself and your organization. 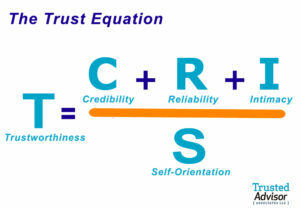 The Trust Equation uses four objective variables to measure trustworthiness. These four variables are best described as: Credibility, Reliability, Intimacy and Self-Orientation. TQ stands for Trust Quotient. The Trust Quotient is a number — like your IQ or EQ — that benchmarks your trustworthiness against the four variables. The Trust Equation has one variable in the denominator and three in the numerator. Increasing the value of the factors in the numerator increases the value of trust. Increasing the value of the denominator — self-orientation — decreases the value of trust. Self-orientation, which sits alone in the denominator, is the most important variable in the Trust Equation. We developed the formula this way on purpose. A seller with low self-orientation is free to completely and honestly focus on the customer — not for his own sake, but for the sake of the customer. Such a focus is rare among salespeople (or people in general for that matter). The truth in selling is that you succeed more at sales when you stop trying to sell. When all you focus on is helping prospects, they trust you more and buy from you more as well. The Trust Equation covers the most common meanings of trust that you encounter in everyday business interactions. What’s important to remember is that the meanings are almost entirely personal, not institutional. People rarely give over their trust to institutions; really they trust other people. While companies are often described as credible and reliable (the first two components of The Trust Equation), it’s really the people within the companies that make those companies what they are. And intimacy and self-orientation are almost entirely about people. Trust in business and selling requires good “scores” on all four variables in the Trust Equation. You want high credibility, reliability and intimacy, and low self-orientation. Living the four Trust Values is the best way to increase your trustworthiness. The Trust Equation provides a scientific, analytical and actionable framework for how we help organizations and individuals improve their businesses and lives.